The Centers for Disease Control and Prevention reports that dental caries is the most common childhood disease in America today, five times more common than asthma. Even more alarming is the fact that the decay rate is on the rise. Today, 8% of our nation’s infants and toddlers have “Early Childhood Caries,” formerly called “Baby Bottle Tooth Decay.” Approximately 18% of three-year-old children have more than one cavity. That number increases to 40% in five year olds with more than 95% of eighteen-year-olds having had at least one cavity. 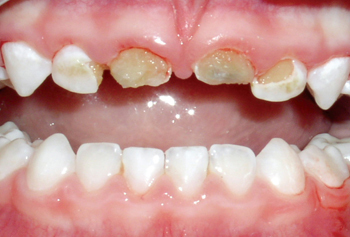 Of concern is the association between early childhood caries and an increased rate of permanent tooth decay. 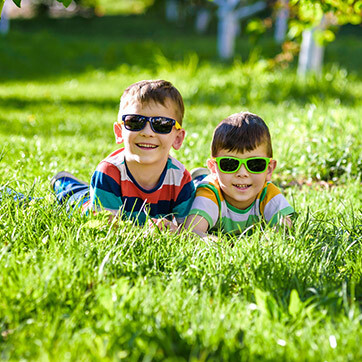 The doctors at All Kids Dental offer multiple strategies to help prevent such problems and to help your child become a cavity-free adult. Begin brushing your child’s teeth early, when the first tooth presents. Discontinue the night and naptime bottle between 12 and 14 months of age. See your pediatric dentist every six months beginning at age one. Brush your child’s teeth before bedtime, with nothing to drink but water after brushing. Start using a small smear, or a grain of rice sized amount of fluoride toothpaste at your child's second birthday.. Minimize between meal snacks or drinks. Get your child in a good, active water drinking routine. Begin flossing your child’s teeth as soon as they start touching, usually by age 4..
Have sealants placed on all permanent back teeth. Provide a well-balanced diet with a variety of foods from the five major food groups. Until your child can write their name in perfect cursive (around age 8), continue brushing and flossing their teeth at least once per day. At that point, transition them to brushing and flossing independently, with occasional parental supervision.